This model is only available in SysCAD 9.3 and later versions. The OLI Reactor model allows the user to 'call' the OLI analyser to determine the state of an aqueous solution. The composition, temperature and pressure of the 'Feed' stream are based on the feed to the unit. The unit will then determine the equilibrium conditions of the resulting stream. The results can be applied to the product stream or just performed as a side calculation. The user MUST have added and initialised an OLI Chemistry Model unit in the SysCAD project before this unit can function. The user MUST have a valid OLI license to make use of the OLI functionality in SysCAD. Please see olisystems.com for more information. 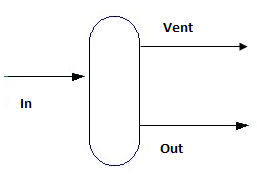 The diagram shows a drawing of the OLI Reactor unit, with In, Out and Vent streams. When the user inserts the OLI Reactor unit into a flowsheet, a different graphics symbol can be selected from a pull down menu. The streams may be connected to any area of the drawing without affecting the actual connection point as SysCAD ignores the physical position of the connection. The OLI Reactor uses the OLI algorithms and data to determine the status of the aqueous solution. The InFlow and OutFlow are displayed using OLI species, as defined in the dbs file specified in the corresponding OLI Chemistry Model. The OLI calculations performed are similar to using OLI Studio. Please see http://www.olisystems.com/ for more information. The tabs and variable names are described in detail in the following tables. OLIReactor tab - This first tab contains general information relating to the unit and allows the user to set the model (Reactor or Side Calculation). Results tab - This tab summarises the results. QFeed - Optional tab, only visible if ShowQFeed is enabled. This page shows the properties of the mixed feed streams. This is before OLI is called. InFlow tab - This tab displays the composition of the feed stream (QFeed) in terms of OLI compounds. OutFlow tab - This tab displays the composition of the final solution as determined by OLI. Ionic tab - Option tab, only visible if ShowIonic is enabled. This tab displays the amounts of the OLI Liquid Ionic Output Species (True Species) that OLI predicts would be present in the final solution. Parms tab - This tab lists the results for OLI parameters. This tab is not visible if CalculateProperties is set to Minimal. Scale tab - Optional tab, only visible if ShowSolScaling is enabled. This tab lists the scaling tendencies of the OLI solids. QProd - Optional tab, only visible if ShowQProd is enabled. This page shows the properties of the Product stream from the unit. Links tab - contains a summary table for all the input and output streams. Unit Type: OLIReactor - The first tab page in the access window will have this name. On Tick Box This allows the user to disable the OLI calculations, and the unit becomes a simple conduit with no calculations. Model Side Calc The results from OLI will be displayed but will not be applied to the output stream (input composition = output composition). Reactor The results from OLI will be applied to the output stream, potentially affecting the composition and temperature/enthalpy of the stream. CalculateProperties Minimal The only results calculated are those shown on the Results tab page. Basic Basic OLI results such as mass, moles, density and enthalpy are calculated and shown on the Parms tab page. Transport In addition to the Basic OLI results, transport properties such as thermal conductivity, viscosity and surface tension are calculated and shown on the Parms tab page. All All OLI results are calculated and shown on the Parms tab page. OpMode FeedT Get OLI to perform an Isothermal calculation at the stream feed temperature. FixedT Get OLI to perform an Isothermal calculation at the user-specified temperature. TemperatureReqd / T_Reqd Input Only visible if OpMode is set to FixedT. The required temperature of the product stream from OLI. FixedHeat.MaxIterations Input Only visible if OpMode is set to FixedHeat. The maximum number of iterations (calls to OLI) to make in a single SysCAD iteration/step. FixedHeat.Damping Input Only visible if OpMode is set to FixedHeat. The amount of damping used when iterating to converge on temperature. FixedHeat.AbsTol Input Only visible if OpMode is set to FixedHeat. The absolute tolerance for convergence of temperature. FixedHeat.Iterations Display Only visible if OpMode is set to FixedHeat. The number of iterations (calls to OLI) made by this model during the last SysCAD iteration/step. Calc.MinTemperature / Calc.MinT Input The minimum temperature for the final solution determined by OLI. Calc.MaxTemperature / Calc.MaxT Input The maximum temperature for the final solution determined by OLI. Method AutoDetect If there are any liquids AND no vapours present in the feed, outlet streams will take the highest pressure of the feeds. Else (eg. some vapours present) outlet streams will take the lowest pressure of the feeds. LowestFeed The unit will operate at the lowest pressure of the feeds. HighestFeed The unit will operate at the highest pressure of the feeds. Atmospheric The unit will operate at Atmospheric Pressure. The atmospheric pressure is calculated by SysCAD based on the user defined elevation (default elevation is at sea level = 101.325 kPa). The elevation can be changed on the Environment tab page of the Plant Model. RequiredP The unit will operate at the user specified pressure. IgnoreLowMassFlow / IgnoreLowQm Tick Box This option is only visible if the AutoDetect, LowestFeed or HighestFeed methods are chosen. When calculating the unit pressure, SysCAD will ignore the low flow feed streams should this option be selected. The low flow limit is set in the field below. LowMassFlowFrac / LowQmFrac Input This field is only visible if the IgnoreLowMassFlow option is selected. This is the amount any stream contributes to the total flow. For example, if the total feed to the unit is 10 kg/s, and this field is set to 1%. Then any feed streams with less than 0.1 kg/s will be ignored in the pressure calculations. PressureReqd / P_Reqd Input This field is only visible if the RequiredP method is chosen. This is the user specified pressure. Result Display The actual pressure used for the sum of the feeds which will also be the unit pressure. HeatLossMethod None No heat lost to the environment. EHX.HeatLossReqd Input This field is only visible if the Fixed HeatFlow method is chosen. This is the user specified heat loss required. EHX.HTC Input This field is only visible if the Ambient method is chosen. This is the user specified heat transfer coefficient. EHX.Area Input This field is only visible if the Ambient method is chosen. This is the user specified heat transfer area. EHX.AmbientT Display This field is only visible if the Ambient method is chosen. The ambient temperature used in the heat loss calculations. The temperature can be changed on the Environment tab page of the Plant Model. TrackBypassOther Tick Box Gives warnings if there are unmapped species in the feed (not mapped to OLI compound and Bypass not enabled in OLI Chemistry Model) . These are bypassed (sent straight to product stream, not sent to OLI). ShowIonic Tick Box Ionic tab page will become visible, showing the OLI predicted liquid ionic species. ShowSolScaling Tick Box Scale tab page will become visible, showing the scaling tendencies of the OLI solid species. ShowAllParms Tick Box If CalculateProperties is set to Basic or Transport, then show all OLI parameters on the Parms tab page. Parameters that are not being calculated will appear in a slightly different colour. ShowQFeed Tick Box QFeed and associated tab pages (eg Sp) will become visible, showing the properties of the combined feed stream. See Material Flow Section. ShowQProd Tick Box QProd and associated tab pages (eg Sp) will become visible, showing the properties of the product stream. See Material Flow Section. UnitTag Input The tag of the OLI Chemistry Model. If a valid OLI Chemistry Model unit is available, then SysCAD will display the tag of that unit here. The user may also enter the tag in this field. Check If the user clicks on this button, SysCAD will check that the tag is a valid OLI Chemistry Model unit. ConnOK Tickbox If SysCAD finds a valid OLI Chemistry Model unit, then this field will be enabled. Status OK The specified Chemistry Model has been initialised correctly and the database file has been found and loaded correctly. ChemModel Tag not Specified No tag has been specified for the Chemistry Model. Specify the desired Chemistry Model in the UnitTag field. Valid ChemModel Tag Required The tag specified for the Chemistry Model in the UnitTag field is invalid and needs to be corrected. Init Required The specified Chemistry Model needs to be initialised. ChemModel Load Required The database of the specified Chemistry Model needs to be loaded. OLI DLL or Version Error There is a problem with the OLI DLL or version. Init Failed Initialisation of the specified Chemistry Model has been attempted but failed. This tab summarises the results. LastCalcType Display Displays the type of OLI calculation performed in the most recent run. Options are: Isothermal, Isenthalpic or unknown. LastCalcTime Display Displays the time taken to perform the OLI calculation in the most recent run. ErrorCount Display Displays the count of errors encountered while performing the OLI calculation in the most recent run. Temperature / T Display Displays the resulting temperature from the OLI calculation. Pressure / P Display Displays the resulting pressure from the OLI calculation. Enthalpy / totHf@T Display Displays the resulting enthalpy from the OLI calculation. MoleFlow / QMl Display Displays the total moleflow used by the OLI calculation. MassFlow / Qm Display Displays the total massflow used by the OLI calculation. pH Display Displays the resulting pH from the OLI calculation. Calc.Temperature / Calc.T Display The final temperature of the predicted product stream. Calc.Pressure / Calc.P Display The final pressure of the predicted product stream. Calc.TotalTime Display The time taken to perform the OLI calculation. Calc.Count Display The number of times the OLI engine was called. Bypass.MassFlow / Bypass.Qm Display (A) This displays the amount of material bypassing the OLI stream analysis that are user specified. This is selected in the OCM model, by selecting the Byp tickbox on the InFlow Tab. BypassOther.MassFlow / BypassOther.Qm Display (B) This displays the amount of material bypassing the OLI stream analysis that are not mapped to an OCM species model. OLI.Feed.MassFlow / OLI.Feed.Qm Display (C) This displays the amount of material being evaluated by the OLI stream analysis. Feed.MassFlow / Feed.Qm Display (A+B+C) This displays the total feed mass flow. Bypass.HeatFlow Display (B) This displays the heat flow resulting from material being bypassed. OLI.Feed.Enthalpy / OLI.Feed.totHf@T Display This displays the Feed stream Enthalpy to OLI stream analysis. OLI.Prod.Enthalpy / OLI.Prod.totHf@T Display This displays the stream Enthalpy at the completion of the OLI stream analysis. OLI.HeatFlow Display The difference between the enthalpies of the Feed and Product streams calculated by OLI. HeatFlow Display (A+B+C) The sum of the heat loss, bypass and OLI heat flows. MassFlow / Qm Display Resulting Mass Flow. MoleFlow / QMl Display Resulting Mole Flow. Temperature / T Display The temperature of the stream. Either temperature or enthalpy is conserved depending on the calculation method selected. Enthalpy / totHf@T Display The enthalpy of the stream. Either temperature or enthalpy is conserved depending on the calculation method selected. The enthalpy calculated by OLI and by SysCAD are displayed and compared here. The difference is caused by equation/constants used to calculate enthalpy by the two packages are slightly different. This tab displays the composition of the feed stream (QFeed) in terms of OLI compounds. If the Hide Zeros button is clicked, all compounds that have NO mass will be hidden. If the Show Zeros button is clicked, all compounds will be displayed, including those with no mass. The next table displays the OLI compounds in the selected database and their amounts in the feed, based on the mappings defined in the OLI Chemistry Model. MassFlow / Qm Display The mass flow of the compound in the feed. MoleFlow / QMl Display The mole flow of the compound in the feed. This tab displays the composition of the final solution as determined by OLI. If the Hide Zeros button is clicked, all species that have NO mass will be hidden. If the Show Zeros button is clicked, all species will be displayed, including those with no mass. The next table displays the OLI species in the selected database and their amounts in the final solution, as determined by OLI. The SysCAD species that is mapped to the OLI species, defined in the OLI Chemistry Model, is shown on the far right of the table. MassFlow / Qm Display The mass flow of the species in the final solution. MoleFlow / QMl Display The mole flow of the species in the final solution. MassFrac / MF Display The mass fraction of the species in the final solution. MassFlow / Qm Display The mass flow in the final solution. MoleFlow / QMl Display The mole flow in the final solution. MassFrac / MF Display The mass fraction in the final solution. This tab displays the amounts of the OLI Liquid Ionic Species (True Species) that OLI predicts would be present in the final solution. The next table displays the OLI liquid ionic species in the selected database and their predicted amounts in the final solution. OLI Species The name of the liquid ionic species in the OLI database. MassFlow / Qm Display The mass flow of the liquid ionic species in the final solution. MoleFlow / QMl Display The mole flow of the liquid ionic species in the final solution. MassFrac / MF Display The mass fraction of the liquid ionic species in the final solution. This tab lists the results for OLI parameters. The relevant conversion unit is displayed in brackets beside the parameter name. Depending on other selections, this page may not be visible or all parameters may not be visible. Only visible if ShowSolScaling is enabled. This tab lists the scaling tendencies of the OLI solids. The next table displays the relevant solid OLI species from the selected database and their scaling tendency. OLI Species The name of the solid species in the OLI database. Scaling Tendency Display The scaling tendency of the solid to be formed. >1 means solid formed. <1 means close to being formed. <<1 means not likely to be formed. Refer to OLI Example Projects for example projects which demonstrate the use of this model. This page was last edited on 8 November 2018, at 00:34.